Visit the remarkable Baarle-Hertog and you might end up with more questions than answers. For a start, it’s extremely difficult to describe. When you first hear people talking about it you think it’s merely a village cut in half by the border between Belgium and the Netherlands. Oh if it were only that simple. But it’s not. For a start, Baarle-Hertog is not actually on the Belgium-Netherlands border at all. It lies a few kilometres inside the border. In the Netherlands. Yet the village is very much part of Belgium. Then there’s its name. You enter the village and are welcomed not only to Baarle-Hertog, but also to Baarle-Nassau. And no, these are not different names for the same place. It’s not like Gent or Gand; Bergen or Mons. Baarle-Hertog and Baarle-Nassau are different villages, but in the same location. 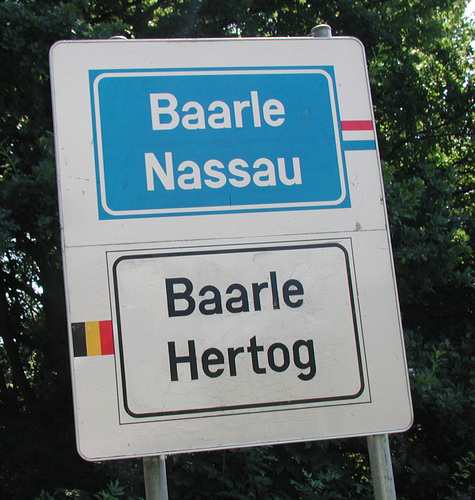 Baarle-Hertog belongs to Belgium; Baarle-Nassau belongs to the Netherlands. Still with me? Even more confusingly, these two places are made up of Belgian and Dutch pockets of land that are mixed up with each other. Imagine that a child has mixed up two different jigsaw puzzles, thrown all the pieces up in the air to see how they land, and then drawn lines around collections of pieces from the same puzzle. That’s a bit like the situation in Baarle-Hertog and Baarle-Nassau. Each collection of Belgian and Dutch pockets of land is actually an enclave. In political geography, an enclave is a country or part of a country lying wholly within the boundaries of another country. Well-known examples are West Berlin before reunification, San Marino in Italy, Vatican City in Rome, and Lesotho in South Africa. However, the Baarles beat all of these. Baarle-Hertog and Baarle-Nassau are made up of no fewer than 30 enclaves: 22 Belgian enclaves, 1 Dutch enclave and 7 Dutch sub-enclaves (don’t even ask …!). The result is an extremely complex social, cultural and economic mix. So, for example, while there are many joint Belgian-Dutch organisations, such as a library and cultural centre, and common public provisions for water, gas and sewage, other facilities bewilderingly double up. There are 2 fire services, 2 churches, 2 police services, and double provisions for electricity and telephony. Blame it on the Medievals! The origins of this puzzle lie with medieval feudalism, which split up the land into a patchwork of pockets that belonged to the local duke or count. In this area, some pockets were owned by the Duke (hertog) of Brabant (hence Baarle-Hertog) and others by the House of Nassau (hence Baarle-Nassau). After the independence of Belgium in 1831, the border between Belgium and the Netherlands had to be determined by a border commission. In the area around Baarle, this patchwork of parcels was so complex that it proved impossible to come to a definitive agreement. Between border posts 214 and 215, instead of a fixed border, each of 5,732 pockets of land had their nationality laid down separately. There have been numerous attempts to dismantle the enclaves. As recently as 1996, plans were drawn up to make Baarle-Hertog part of Turnhout. Baarle-Nassau would then join with nearby Alphen and Chaam to form a new Dutch municipality. Both the Dutch and the Belgian parliaments voted against the motion. Walking through the Baarles is a unique experience. You constantly criss-cross between Belgium and the Netherlands. You will also notice that in the streets divided into Belgian and Dutch parts, there is no continuous numbering of houses. A street name and number can even occur twice: once in Baarle-Hertog and again in Baarle-Nassau. One house even has a front door where the border goes right through the middle of it. What’s more, as each house is deemed to pay taxes in the country where its front door is located, it is an old tradition in Baarle to move the front door some metres if that creates a more favourable fiscal situation. This isn’t just crazy theory; it’s crazy practice too. More than one family has moved their front door from one country to another. The inhabitants of the Baarles are certainly efficient in attracting tourists. Particularly on warm dry weekends the place is packed with day trippers. This of course means great business for the many shops (open on Sundays), cafés and restaurants. It’s a fascinating place to visit. 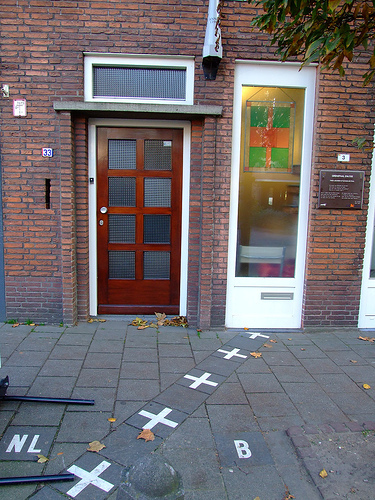 The borders are painted on the roads and pavements, while front doors are marked or flagged with their national identity. At the tourist office in Nieuwstraat you can pick up a wide range of walking guidebooks. The one entitled ‘Enclave In, Enclave Uit’ will take you on a tour of the village and is crammed with interesting facts and stories. 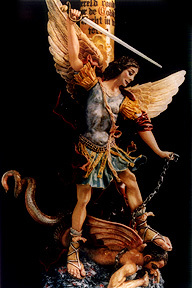 You may also like to visit Baarle’s Museum with its collection of religious scenes hand-carved from wax by Fritz Spies. An impressive example is the 2.5 metre high copy of Leonardo da Vinci’s The Last Supper, which is sculpted from 200 kg of beeswax. Another museum in Baarle is Vergane Glorie, with its collection of old hand tools used by local builders, bakers, smiths, carpenters and cobblers, as well as various war memorabilia from the two world wars. If you fancy a weekend in this fascinating place, I recommend De Hertog van Baerle, a B&B which also offers wine-tasting weekends and brewery visits. It’s an extremely civilised base from which to visit this utterly bizarre place, which has to be one of the most confusing places in the world. Glad you enjoy the blog. Let me know how you get on in Baarle-Nassau! Great little place but … for de senior people visiting, and as in Belgium proper, dont expect any public conveniences at all best you can do is go to a local pub and order something, very costly and naturally the problem starts all over again after a short while, be warned! Thanks for your warning James. Dank u wel! I was listening to a BBC story about the upcoming NL elections and they referenced some towns in the southern Netherlands. I went to Google maps and found the strange scribble of black border lines. Then I found your story that explains it all. Hi and thanks for your comment. I am happy to see that the article was useful. It’s quite a confusing place isn’t it? Do let me know how you get on Marvie. And if you take some interesting pictures, I would love to add them to this post! This is fascinating! It’s not often you get to see the results of medieval land feuds so obviously reflected in modern villages! The EU must have made lives for these people much easier than crossing boarders multiple times a day! I’m glad I’m not the village postman! Or both of the village postmen, if they have one for each country!? Haha. Yes, very sharp of you Josy! Maybe they employ one with a split personality. That could work! As long as the speak both languages…although I have a feeling most people are multilingual if they live in such a village!! Thankfully they speak the same language. Phew! This sounds confusing, but also like a super interesting place to visit.